This thread is for comments about our Cabalist's Tome Tempo Mage Standard deck. I had the pleasure of watching Asmodai hit Rank 1 this morning using this deck. He's an incredible mage player, and has very good success using Antonidas [which had been dropped from the meta] due to the Thaurissan synergy. I normally don't play Cabalist's Tome and Antonidas because they feel "slow" but he obviously manages to make it work for him. I was sad to see Antonidas disappear (was my first and favourite legendary), but it's nice to see him returning. Can't wait to try this deck out. Cablist's seems to be one of those cards that can either be unbelieveable or give you 3 shatters. There's no inbetween! This deck is very similar to the Mage I was already running. I made the changes to see how Sottle's version played out compared to my to my own and I think I like his a little better (Minus Yogg). I played a Shaman last night who switched his Hero Power to the Warrior's and he proceeded to beat me down to 1hp while he sat at 30 +5. What ended up being his doom was he ran out of gas while my Cabalist's Tome kept giving me Cabalist's Tome. I came back and got the win still sitting at 1hp. As far as Archmage Antonidas "returning" to the Meta, for me he never left. I came back and got the win still sitting at 1hp. As far as Archmage Antonidas "returning" to the Meta, for me he never left. Hey guys. Looking to craft a new deck and I have always enjoyed the mage hero. This deck seems like it would be super fun to play with the yogg, cabalist tome's, antonidas, and all the tempo generated from the low cost spells, flame walker, etc. I have plenty of dust, but the two things I am slightly hesitant to craft are the x2 Arcane Blast's. I always try and future proof as much as possible and try and make sure I always get good bang for the buck. Being that they are from the grand tournament and the next cards to leave the standard set, it has made me slightly hesitant. Are there any good card swaps or replacements for them? The rotation most likely won't happen until Spring of 2017, so you'll have a LOT of time to play with those ABs. They're also very strong in this deck. Thanks for the input guys. Yeah I think I'm looking at like 6000 dust for this because I'm missing three legendaries. Kind of a lot of dust to swallow lol and I guess the AB's only account for 800 of that. That's what I was thinking. It started in Spring, it would only make sense (by my logic) to switch it in Spring. You never know with Ben and Company though. I'm missing yogg, thalnos, and tony. The only card that is really necessary for this deck out of the 3 is Archmage Antonidas. Bloodmage Thalnos can be replaced by Loot Hoarder if you want the extra card draw or Kobold Geomancer if you want the Spell Damage. Yogg-Saron, Hope's End can be replaced by a number of cards in my opinion. For this build you could opt to go with Arcane Giant since it is so spell heavy. I recommend 2x Water Elemental and 1x Forgotten Torch or Flamestrike. You might be better off with regular tempo mage though. I agree since Archmage Antonidas is so important to this build. 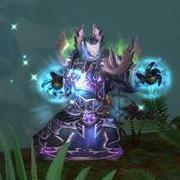 IMO if you are serious about playing Mage than he is THE legendary to craft. Definitely worth buying the welcome package in case you grab Antonidas from it. I, too, have always hesitated to craft Arcane Blasts. I recommend 2nd Mirror Image as one of the replacements. I recommend 2nd Mirror Image as one of the replacements. An interesting replacement, but thanks for sharing nonetheless! Now that Yogg has been nerfed, is it still worth playing it or is Arcane Giant better? I dont have second tome and yogg.i replaced yogg with rag and second tome with water elemental.is this deck good with only one tome or should i stick to classic tempo mage? It would probably be better to stick with regular tempo, though if you get bored, you can try this one, even with only one Cabalist's Tome. I have been running this deck - not legend play but rank 10ish. I have had a lot of success with Yogg. He is still really good and can make some great comebacks. It's nice knowing that he is in there for those otherwise unwinnable situations. He is even more of a hail mary play now than he was before, but I think that's okay. Exactly. There is no single card in the game that can bring you back to a point of being able to win like Yogg can. He's definitely still worth it.